The print in the Lyon Collection is the left panel of a diptych. Created to commemorate a performance of the play Ichinotani Futaba Gunki (一谷嫩軍記) at the Kado Theater in Osaka in the 3rd month of 1825. This play is based on the Tale of Heiki. Kumagae Jirō, the fellow seen on the right below, is the most important figure. This scene is most likely from Act II. But first a little background: "Seventeen years before the play opens, Fuji no Kata, a lady-in-waiting to the Emperor, had among her ladies one named Sagami. Sagami fell in love with a warrior of the proscribed Genji faction, Kumagai Jiro Naozane. For a lady of the court to take a lover was an offence punishable by death, or at best exile, and Kumagai was, moreover, of the enemy clan. Sagami was already with child, and her plight was desperate, but her mistress took pity on her. With the help of Fuji no Kata the pair were able to fly to Western Japan. They vowed eternal gratitude to her." Quoted from: The Kabuki Handbook by Aubrey S. and Giovanna M. Halford, p. 84. The entire diptych is illustrated in color in Osaka Prints by Dean J. Schwaab on page 109. However, the Schwaab example is from a different edition where Sagami is played by a different actor, Nakamura Matsue III. Schwaab wrote: "The third play of the series of the 'farewell'production [of Utaemon III] revolves around the role of Kumagai, regarded as one of the great aragoto kabuki roles... The role was in fact given the definitive performance by Utaemon II; and a Baigyoku-kata, or Utaemon mode, was later further developed by other great aragoto actors, such as Ichikawa Danjūrō VII. 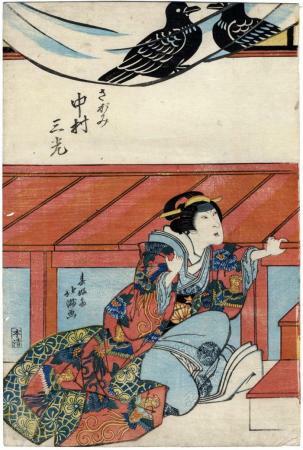 The scene shown here is one of the famous moments in the play, wherein the actor holds Kumagai's mie, or fixed ferocious facial expression with crossed eyes, while holding a signboard."